After the walls of the home are framed, it is time to add the roof. Today most residential roofs are created with pre-manufactured trusses. This is the fastest and most economical method of creating a pitched roof. If you are trying to use the space within the roof for livable space, then the roof must be ‘stick framed’ which means each beam and roof rafter is hauled up and installed one by one. 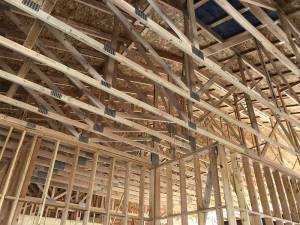 While the materials for this type of roof may be less than ordering trusses, the labor involved makes this a more expensive process. 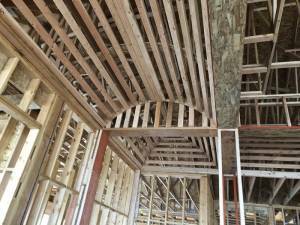 The attic space in this home will be used for running mechanical ducts for the main floor. 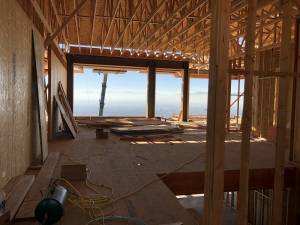 While the majority of the time this home will be heated by the radiant system installed in the floors, a standard gas-fired furnace will be on hand for quickly heating the space if needed. This same ductwork will be used for delivering cooled air throughout the house in the summer. Putting these ducts below the concrete slab for the lower level and in the attic for the main level means we can avoid any drops in the ceilings in the livable area needed to conceal ductwork. Framing also includes any special features a home may have. In this home, and arched ceiling with groin vaults will define the main path of circulation through the main level from the front door to the balcony at the rear of the home. 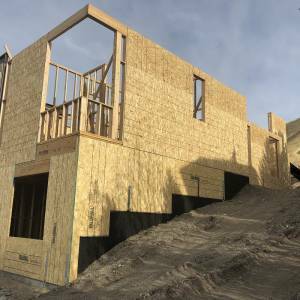 The framers also add oriented strand board sheathing (similar to plywood) to the exterior walls to begin the process of enclosing and drying in the home.